Our mission is to help conserve the natural environment of the Greater Blue Mountains and to increase awareness of the natural environment in general. Submissions on the EIS are due by 18th December 2015. 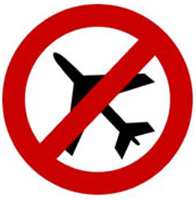 We need YOU to write a Submission to the EIS opposing the Airport! "I live in The Blue Mountains and strongly oppose the proposed Western Sydney Airport for the following reasons." "Thanks you for the opportunity to make a submission. Sincerely"
then write and sign your name and include your address. If you have the energy, it is good to send the same letter to several politicians. It is more effective not to include a "CC:" list. Using the Colong Foundation's guide you can object to a proposed Western Sydney Airport. You can call for the draft EIS to be revised and re-exhibited with options for flight paths, operating modes and runway orientation to ensure noise pollution impacts are avoided to the greatest extent possible. A revised draft EIS must consider how to minimise environmental impacts by considering various options that improve environmental outcomes for the proposed airport. 1. Impact on World Heritage. The Blue Mountains National Parks were declared as World Heritage in 2000, primarily for their eucalypt biodiversity. What will be the impact on this biodiversity of a 24-hour, no curfew airport only 10 km away? Burned jet fuel, fine particulates, noise, potential fuel dumping, all raining down on the eucalypt forests we all know and love. The whole point of World Heritage Listing is to commit all levels of Government to preserving the area for the whole world to enjoy. The listing process stalled in the late 1990's as UNESCO were worried about the impact of a Western Sydney Airport. An Airport at Badgerys Creek risks World Heritage status for the Blue Mountains. 2. Impact on Drinking Water Catchments. Once the Airport is operational, flights to the West will have to fly over either the Blue Mountains townships (political poison), or the drinking water catchments. The by-products of aircraft will rain down in the catchments and end up in Sydney's drinking water. The 'Special Areas' are there to exclude humans, to provide a buffer around the lake, to ensure water quality. Flying large numbers of huge, noisy, polluting aircraft over the catchments is dangerous and risky. The Blue Mountains includes several declared Wilderness Areas. In a declared Wilderness area you must be self-reliant, so no machines are allowed, no mountain bikes, no cars, and no helicopters. The Badgerys Creek Airport threatens all of this. How can we on a Wilderness walk, or the animals that live in these pristine areas, enjoy the quiet and fresh air with a steady stream of aircraft flying overhead, belching out particulates and noise? How is it we can't take even the most simple machine into Wilderness, but our most complex machines are able to fly over it? The Greenhouse Gas Emissions from the proposed Airport will exacerbate climate change and cannot be condoned. While the Executive Summary states that Greenhouse Gas Emissions are 130,000 tonnes CO2-e/annum, I note that this number excludes emissions from Aircraft, and is only the 2030 figure. The real emissions number, including Aircraft, is 2.64 million tonnes in 2030, growing to over 21 million tonnes in the long term, and cannot be allowed in a Greenhouse-constrained world. The Airport proposal is built around assumptions of endless growth in population, economic output, housing, industrial output, and of course Aircraft movements. Growth cannot continue forever, there has to be a limit, and building massive projects based on a false assumption makes no sense. 6. Vegetation at the Badgerys Creek Site. The Airport construction will require the destruction of hundreds of hectares of native vegetation, much of it listed as Critically Endangered. Destruction of this bushland is unacceptable and must be stopped. I do not accept 'offsets' as a method of preserving Critically Endangered Ecosystems, as this is just legalised destruction. Tourists come to the Blue Mountains to enjoy the views, the hospitality, the bushwalks, and the rides at Scenic World. What will happen to the tourism industry when tourists report back to their friends that their quiet enjoyment of the bush was ruined by an aircraft flying overhead? Will the view south from Echo Point be the same with a huge aircraft in the eye line? Everybody who lives in the Blue Mountains came here for a different reason, but we are all united in loving the Community we live in. Cafes, street markets, the Winter Magic parade, leafy streets, hundreds of easy and hard bushwalks, lookouts, Aboriginal and European culture, art, theatre, we have it all. After many years here, I cannot imagine living somewhere else. We put up with a lot us Mountain folk, from endless Highway upgrades, to poor train services, hours commuting to far-away jobs, and bushfires threatening our homes. But we love the place, and do not want it ruined by 24-hour aircraft noise. Kingsford Smith Airport at Mascot runs at about 70% of capacity. It has handled the same number of flights per hour (80) for many years, with growth in passenger numbers catered for by bigger planes, not more flights. Half of all passenger movements through Mascot are to and from East-coast destinations, including Melbourne (24%), Brisbane (13%) Gold Coast (7%), Canberra (3%) as well as Albury, Coffs Harbour and Newcastle. The proposed High Speed Rail network would have stations at all of these places, potentially removing half of the current passengers from Mascot. Travel to Melbourne and Brisbane by High Speed Rail would be safer, faster and far more convenient than flying. Mobile phones and the internet would be available for the whole trip. There would be no need to multiple changes of transport mode (train, walk, fly, taxi) as a High Speed Train can do CBD to CBD directly. Planes talking off from and landing at the proposed Airport will fly over critical infrastructure that cannot be put at risk. These items of infrastructure include: Lake Burragorang (80% of Sydney water supply), Warragamba Dam, Sydney Water Supply Pipeline, Prospect Reservoir, Prospect Water Treatment Plant, multiple electricity lines, large electricity Sub-stations, the M4 and M7 Motorways. In the unlikely event of a plane crash, these critical pieces of infrastructure could take years to replace or rebuild. To people who claim that our opposition to Badgerys Creek is just NIMBY (not in my back yard) is simple, NIABY (not in anyone's back yard). We need to build transport infrastructure that reduces flights at Mascot, for the benefit of the millions affected by aircraft noise and pollution, not increase the flights at a second Airport, and go on to affect millions more. We need transport infrastructure that can run on renewable energy, not burn irreplaceable oil-based fuels that pollute the Global atmosphere. We need integrated transport planning that looks at the effects on people and the environment of each option, not just 'getting on with it' to appear decisive and strong. WHERE CAN YOU SEND COPIES OF YOUR SUBMISSION?